Now we're not entirely sure if it is targeted or if any one may be able to jump on this bonus as the T&Cs (which follow) are a bit vague as they state LifeMiles members with a registered E-mail who subscribe to the offer. It doesn't state the recipient of the email but rather having a registered one. So to give it a shot for your account copy and paste this link: https://www.lifemiles.com/eng/mya/prt/myaprtone.aspx?id=1&action=oto&codpro=AVND02&ftnum=XXXXXXXXXXX and replace the 11 Xs with your LifeMiles #. Then simply book online at Avianca.com by April 8th and complete your travel by May 31. YMMV. This promotion is exclusive to LifeMiles members with a registered E-mail, who subscribed to the promotion between April 1th and April 8th of 2015. Promotional Code: AVND02. Dates to buy tickets: April 1th to April 8th, 2015. First date to begin the trip: April 9th, 2015. Last date to complete the trip: May 31th, 2015. The miles bonus applies only to tickets purchased and flown during the promotional period. The member must provide its LifeMiles number during the ticket purchase, at the time of check-in or at the Airport Counter. The tickets can be bought through Avianca.com, Avianca´s points of sales, Avianca´s Call Center and travel agencies. 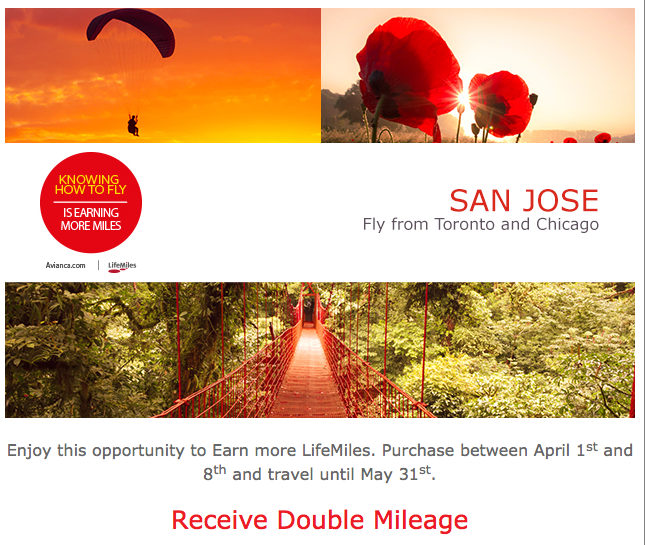 Bonus miles apply between: Toronto or Chicago to San Jose, in direct flights. Bonus miles are valid for Avianca´s route network only. It does not apply for codeshare flights. The miles bonus will be reflected no later than one month after the completion of the trip. The miles bonus applies only to flown miles and do not include the Elite status bonus and the fare family bonus. Also, it does not qualify for Elite status. The miles bonus does not apply for retroactive accruals requested after the promotional period. The miles bonus does not apply for redeemed tickets. LifeMiles Terms and conditions apply, for more information go to LifeMiles.com. LifeMiles is a trademark of LifeMiles Corp.